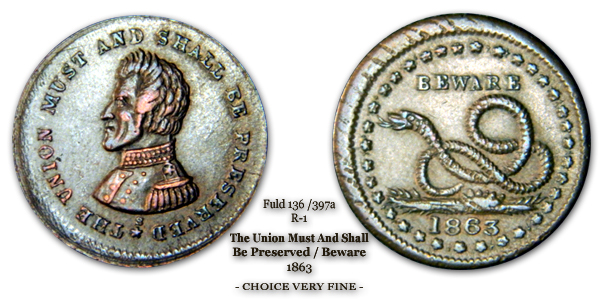 Early in 1862 all United States coins disappeared from circulation. 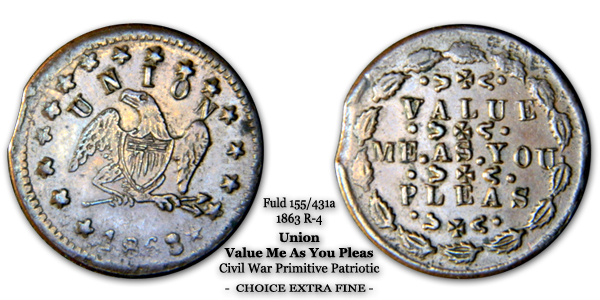 The general public, concerned about possible increases in values of all metals, began hoarding their change. First gold and silver coins disappeared from circulation. 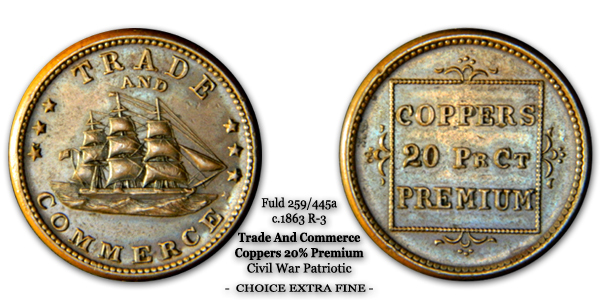 But before long, even copper coinage became extremely scarce. 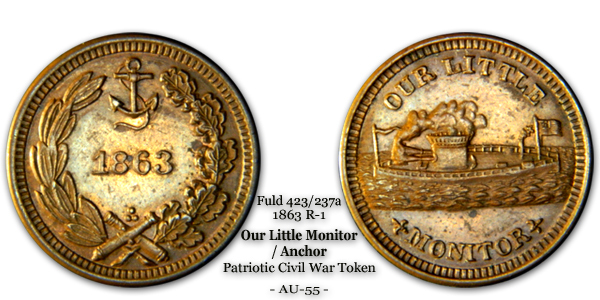 Virtually over night, there were practically no U.S. coins of any denomination in circulation. Merchants and proprietors found themselves in a difficult situation. With no coinage available, they were unable to conduct everyday transactions with their patrons. Resultantly, they found themselves forced to create and issue their own private coinages. The first of such appeared in Chicago in the early decade of the 1860s, and quickly spread elsewhere. 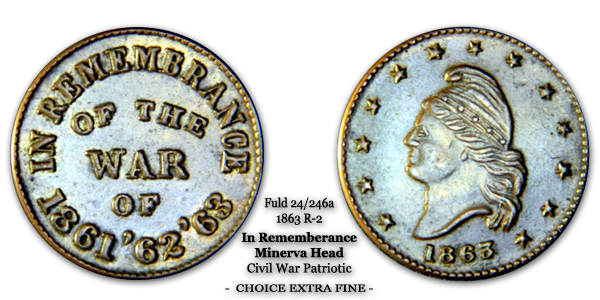 Two distinct types of Civil War Tokens were struck. Both of which served a valuable need for merchants, proprietors, and the general public. Without them, commerce in the U.S. would have slowed to a standstill. The first consisted of storecards, which were tokens that featured a merchant or proprietor’s name and advertisement. The second, illustrated in this article, were known as Patriotics. 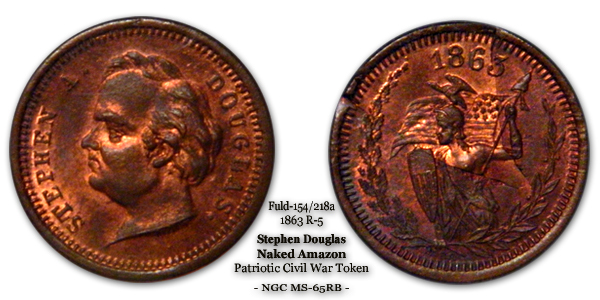 The Patriotics utilized generic, or “stock” dies, and did not explicitly feature any particular merchant or proprietor’s name or advertisement. Rather, the dies usually featured some sort of patriotic theme. 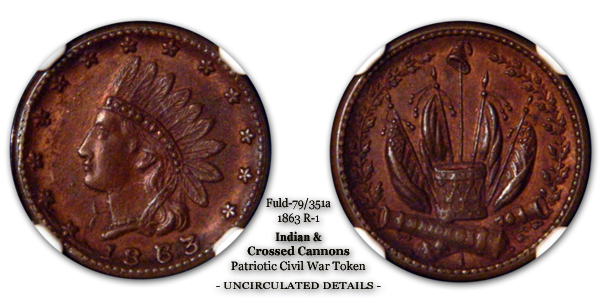 Within 6 months after their first appearance in Chicago, both types of Civil War tokens began appearing elsewhere throughout the country. In the east, private tokens started appearing in New York. Quickly thereafter, they cropped up in Baltimore, Boston, and Philadelphia. In the midwest, they started appearing in Chicago, Milwaukee, and Detroit. Before long, they had spread even to the small towns of most northern states; Rhode Island, Ohio, Wisconsin, Illinois, Indiana, Maine, and the like. 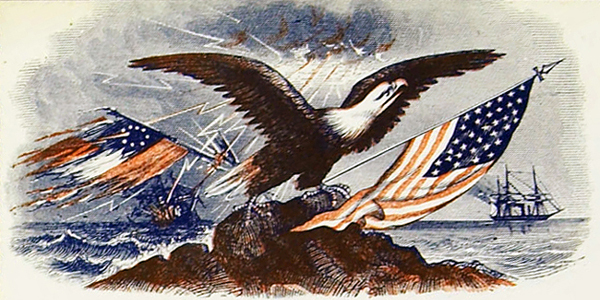 Many of the Patriotics communicated various themes. Proprietors and merchants who would order these generic cards would often select stock dies which reflected their opinions and sentiments towards the war. The following are several samples, organized by theme. 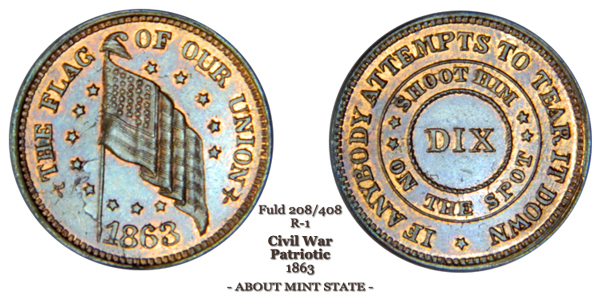 Of total, approximately 25 million private tokens were struck and circulated through the Civil War. Among those millions, there existed over 7,000 unique varieties. 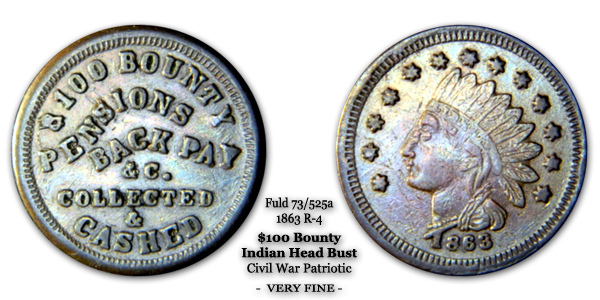 Most were struck in 1-cent denominations, and were typically the size of a U.S. Indian Head cent (19mm). 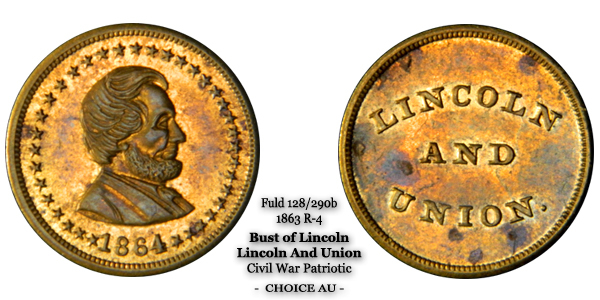 Other denominations were struck, of varying diameters, including those for 5, 10, and 25 cents. However, the quantities and varieties minted for these higher denominations were significantly less. 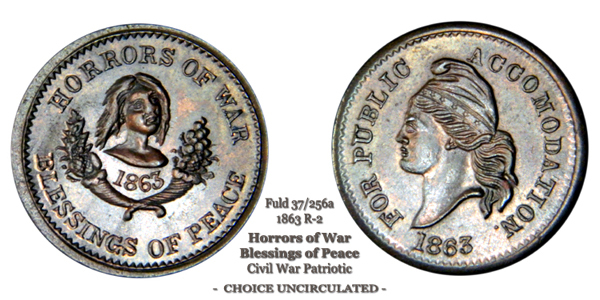 In 1864, Congress outlawed private coinage; thereby severely curtailing all Civil War tokens, including the Patriotics. 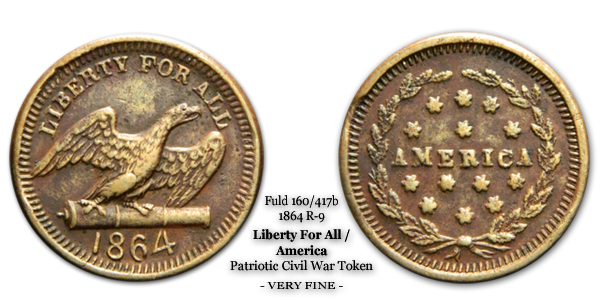 Patriotic tokens are readily available for reasonable and fair prices. 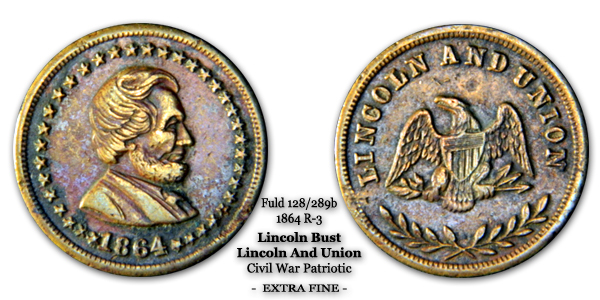 The series is a terrific way for collectors and numismatists alike to venture into collecting exonumia from the Civil War era. 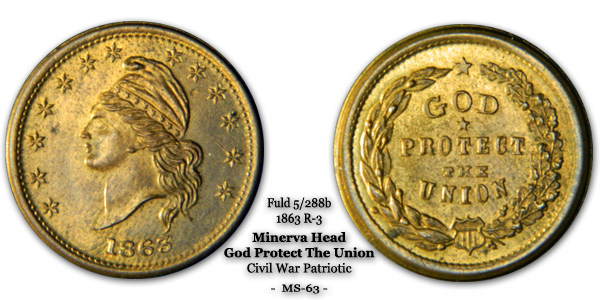 I have an 1863 Army and Navy coin and I didn’t see it in your pictures. I looked at images online and there are slight differences between the one online and mine. I want to know if that means mine is more rare than others. Thanks for your enquiry. 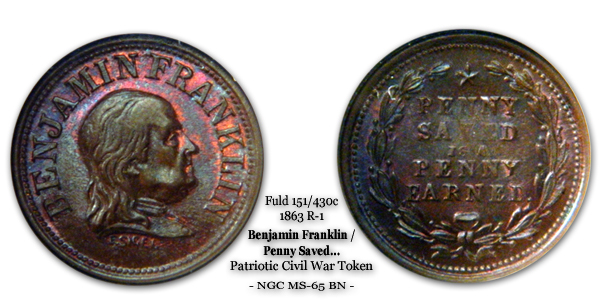 There are lots of sub varieties of the Army / Navy patriotic token. Please email me a clear photo of each side of yours and I will advise as to its rarity. You can find my email in the contact section.